Hedges have a lot to offer in the garden. They give privacy and protection from the eyes of neighbors or passers-by. They create shelter from wind and even sun. They are wonderful sound-barriers from passing cars and busy roads. They give structure to the layout and design of your garden, creating garden rooms and enclosed spaces for different functions. They make the perfect neutral backdrop to flowers and exotic plants too. All in all they are wonderful additions and the basic ‘bones’ of the perfect garden. However they are often just the background, pretty bland and neutral in the end, when with imagination, creative choices of plants and unusual layouts you can turn them into features of your garden in their own right, adding interest and beauty even before any other plants are added to the mix. There are lots of choices for making creative hedges so let’s look at some interesting ideas for making more of your hedges than just a green wall. When choosing plants for a hedge the standard choice is to make the hedge out of just one type of fast-growing tree. This is fine if you just want a neutral backdrop, but it doesn’t have to be that way. Since the form and size of your hedge is mostly created by the trimming process, lots of different plants can be grown together, producing amazing textural and color effects with different shades of green or colored foliage. These tapestry hedges have been grown successfully by creative gardeners since they were first devised around 1900, but many people just choose the same old row of evergreens when so many more choices are available. The idea with a tapestry hedge is to mix a variety of foliage colors and textures together, often using a ‘base’ of an evergreen tree. The plants grow together, helped by regular clipping, into unpredictable and ever-changing patterns, making a bright and colorful effect – the possible choices of plants you can use are endless! So you could start with Emerald Green Thuja (ideal for smaller hedges and colder climates) or Thuja Green Giant (for larger hedges and warmer areas). Then add interest by mixing these with the lighter color of Leyland Cypress, or if you are in warm areas, with the rich, deep green of Italian Cypress. This is a relatively modest approach. For more variety and color mix in the larger, deep-green leaves of Red Beauty Holly, or other Holly Trees and then add a dramatic contrast with the blue-grey foliage of White Spruce or Colorado Blue Spruce. This mix of greens and blues will make a stunning feature out of a normally plain element in your garden. A different choice for blue, with finer foliage closer that of the Thuja, could be Moonglow Juniper, with grey-green foliage and great drought-resistance too. Of course you don’t have to stick to evergreens and adding deciduous trees like the Bloodgood Japanese Maple will bring rich purple-reds into your living tapestry. Burning Bush ‘Fireball’ will be green in summer but add spectacular fall effects with stunning bright red foliage making a climax out of the end of the gardening season. For a lower tapestry hedge, you could mix Danica Globe Thuja with Soft Touch Holly and Blue Star Juniper, for an exciting blend of colors that will grow about two feet tall and wide – perfect to edge a driveway and give interest with little effort needed. Who Says a Hedge Must be Straight? Most of us make the tops of our hedges straight – for some the straighter the better. With a little imagination, you can also clip the top in an undulating pattern, like waves in the sea, or crenellated like the battlements of a fort. These are best formed as the hedge grows, so that the top is completely green, as some hedge plants can’t be cut back hard once they have grown too tall. Of course we usually plant a hedge is a straight line, but where is that idea written in stone? Hedges can have set-back sections to take a garden bench or a giant pot of flowers, or they can curve around the corners of your property, taking a graceful form and framing a gate or driveway. They can also roll across the garden in gently waves, like the famous ‘crinkle-crankle’ walls designed by Thomas Jefferson at the University of Virginia. 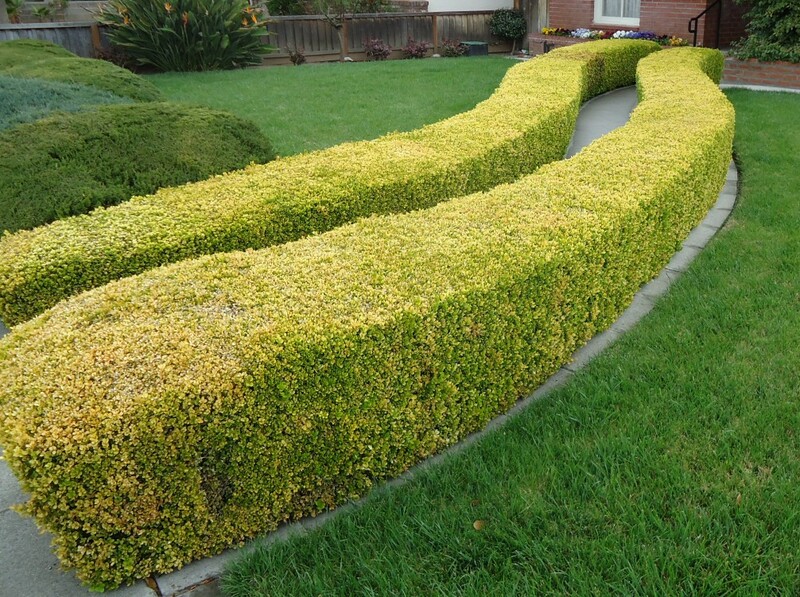 Once the thought that a hedge doesn’t have to be straight takes hold in your mind, the possibilities are endless. For example, a clever way to conceal an entrance to a private part of your garden is to overlap a break in the hedge, with one section curving behind the other – an invisible opening that doesn’t break the continuity of your hedge. Holes in the hedge are usually a problem, but if you have something interesting to see on the other side, why not grow a circular opening in your hedge to frame a picture of the world outside, maybe a distant hill, a lake or the sea, or just to see into one part of the garden from another. This kind of feature should usually be developed as the hedge grows, but it could also be carefully taken out over a period of time as the surrounding plants are trained over the top. Now of course a hedge also doesn’t have to be just leaves, since a colorful flower-display can turn a plain hedge into a thing of beauty and an eye-catching feature in your garden. The secret to keeping a flowering shrub still in flower in a hedge lies in getting the times for trimming right. Some shrubs flower on older shoots and can only really be pruned immediately after flowering. So a flowering hedge can never be quite as neat, but the flower display makes it worthwhile. In cold climates Lilacs are a great hedge-choice and if they are clipped just as the flowers fade and then left, they will flower reliably the next year. The Miss Kim Lilac has a good compact form and makes a lovely six-foot hedge smothered in blue-purple blooms every spring. Lovely informal flowering hedges around four feet tall can be made with the pink-flowering Sunday Fraise Hydrangea which will grow in the coldest areas, or for shady spots in a warmer region the Perfection Double Delights Hydrangea also makes the perfect low hedge. Since Hydrangeas flower on new shoots they should be trimmed in late winter, leaving the new shoots untrimmed so they can burst into flower in summer and fall. For a larger flowering hedge that is hardy and reliable in the toughest conditions, choose the Aristocrat Pear Tree, which will be smothered in bloom in the earliest days of spring, before turning into a neat, healthy hedge for the summer and finishing with a spectacular fall display of red and gold. We usually expect a hedge to reach to the ground, but it doesn’t always have to be that way. Stilted hedges, known more formally as pleached hedges, have straight trunks clear of foliage at the bottom and then spread out into a hedge higher up. This is easier to do with deciduous trees like Maple Trees or Oak Trees, but it can also be done with evergreens like Canadian Hemlock or White Spruce. With a stilted hedge you get the benefits of high screening without closing-in the lower parts of your garden. A stilted hedge can be grown along a driveway, letting you see into the garden beneath it, or used to partially enclose an eating area without blocking the cooling breezes. As you can see, the options for hedges are only limited by your imagination, so let the creative juices flow and make the most of these important garden features, which can be so much more than just a way to enclose your garden or keep out prying eyes. Here at the Tree Center we have a huge range of plants ready to ship to you, so that you can get started on creating a unique and special hedge straight away. What is the name of the hedge featured in the photo at the top of this page? And do such columns come whole for purchase (more desirable) or must one buy baby plants and wait years? I think that hedge is made from golden privet (Ligustrum ovalifolium ‘Aureum’) but you can get a very similar effect with variegated privet (Ligustrum sinense ‘Variegata’), which we have in stock right now. Hedges all need to be grown at home, but privet grows very fast, and a hedge like that should take no more than 5 years to grow.